Ian first developed PlantMod after the publication of the text Plant and Crop Modelling (1990, 2000) co-authored with John Thornley. (Plant and Crop Modelling was originally published by Oxford University Press and re-released by The Blackburn Press. It is available at http://blackburnpress.stores.yahoo.net/biobook1.html.) His aim with PlantMod was to take complex mathematical models and make them accessible to interested researchers and students. Computer power and software tools were less accessible than today and PlantMod was well received as a new means of researching and teaching plant science. His work moved into the area of developing pasture and crop simulation models, in particular DairyMod and the SGS Pasture Model, but he was keen to bring PlantMod up to date and so wrote the more recent version. There is no charge for PlantMod and people are welcome to use it in their studies and research. The program no longer requires a license key and is freely available for use, including over networks. Note that during installation it will give a warning about an ‘unknown publisher’. Current version is 4.1.4. Johnson, I., Thornley J., Frantz, J. and Bugbee, B. 2010. A model of canopy photosynthesis incorporating protein distribution through the canopy and its acclimation to light, temperature and CO2. Annals of Botany 106:735-749. All of the models in PlantMod are completely described in the documentation. 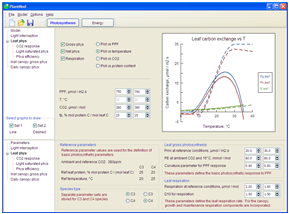 The models give insight into key processes in crop and pasture modelling, including photosynthesis, respiration, water use, temperature, and energy budget, as influenced by environmental conditions and physiological parameters. The different graph options allow over 250 response curves to be plotted. Graphs and simulation data can be copied to the clipboard for use in programs such as Word or Excel. The two main modules of PlantMod are photosynthesis and energy.